I missed last week’s photo assignment of doing a mirror montage. We have had a dreary week with rain and more rain and some of my neighbors have wondered about Noah’s Ark. Due to the drainage projects in Beaumont we have not had a lot of local flooding as we usually do although I did not venture out on the usually chest high water areas. Today I was finally able to mow most of the yard although there was still standing water in many places and the tires of the riding lawn-mower left lovely tracks everywhere I went. I had grand dreams when I read the assignment of possibly getting a photo of the spaghetti bowl of roads in Houston–but opted against when I saw the videos of the water everywhere–reminiscent of Tropical Storm Allison which created havoc in Houston for weeks. 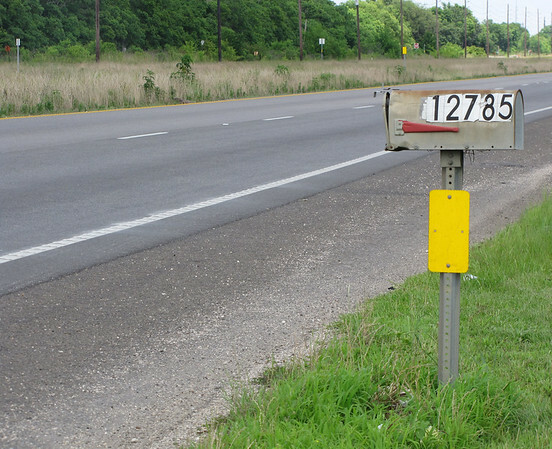 Then I thought about a nice country road–but not when they are full of mud; and so I ended up with a photo of my mailbox. I have always loved mailboxes. It was a window into the world. My father had a mailbox mounted on a board that he would stick into the snowbank as the regular mailbox was buried under many feet of snow; he would remove it before the snowplow arrived. Sometimes he didn’t time it just right and the snowplow driver would stop, come in for a cup of coffee and some cake while he chatted with Dad. Dad would walk out to the mailbox, pull it out and the driver would go on his way and Dad would replace the mailbox. Now as I think back on it, I think the snowplow driver used it as an excuse==as did Dad for a bit of gossip and a place to warm up for a short time. One year, a wren made her nest in that mailbox and the mailman would drive into our driveway and hand us the mail rather than disturbing that wren. When her hatchlings were ready to fly, Dad made sure the mailbox had a firm closure so she could not return. Then there was the time Mom ordered her baby chicks and they arrived by mail with the mailman calling ahead to see if she would be home so he could deliver them, altering his route so those chicks would be the first drop of the day. 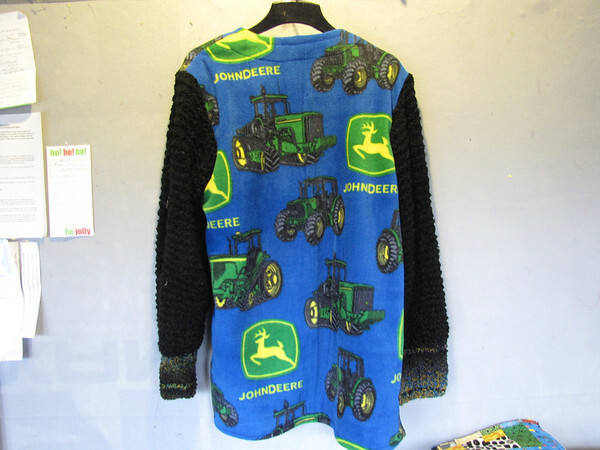 How does anyone live without a John Deere Sweater? 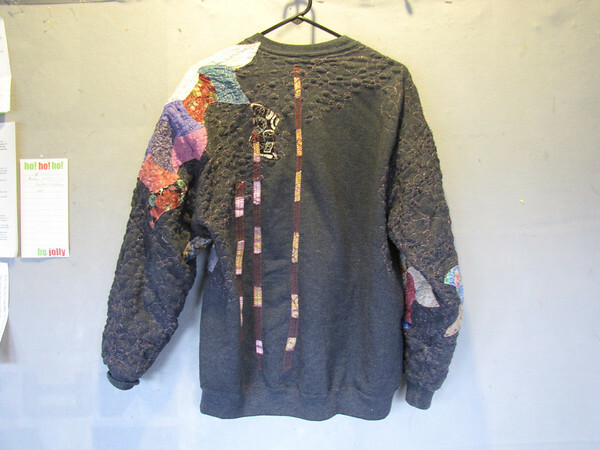 I used a jacket pattern I’ve had for many years and knit these sleeves. Nice, warm, and comfy. My best friend’s daughter brought me a small kit of Liberty of London squares with hexagon papers in London. 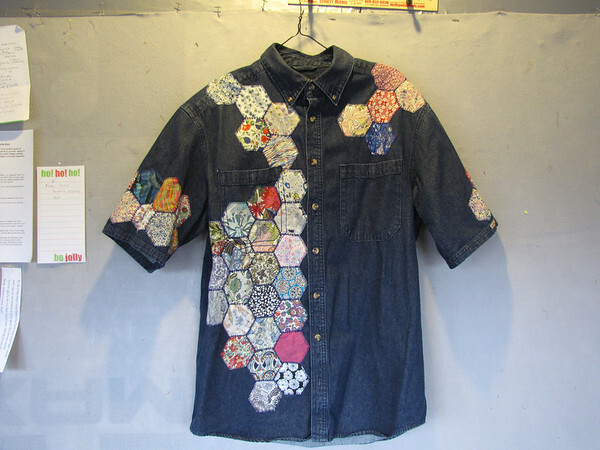 Each piece was different and rather than having them sit in the box I decided I would display them on the denim workshirt. 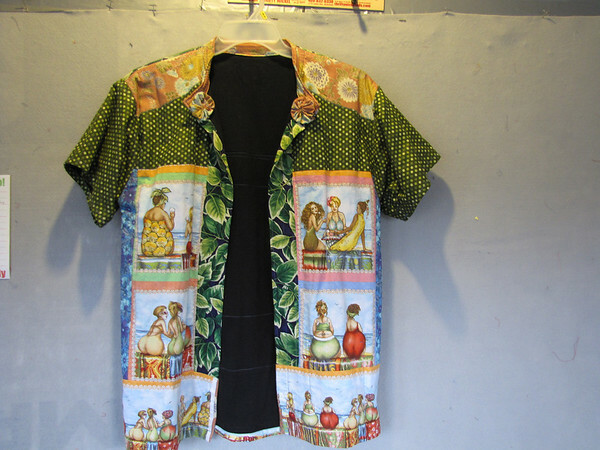 The shirt came from a local lumber-hardware store. 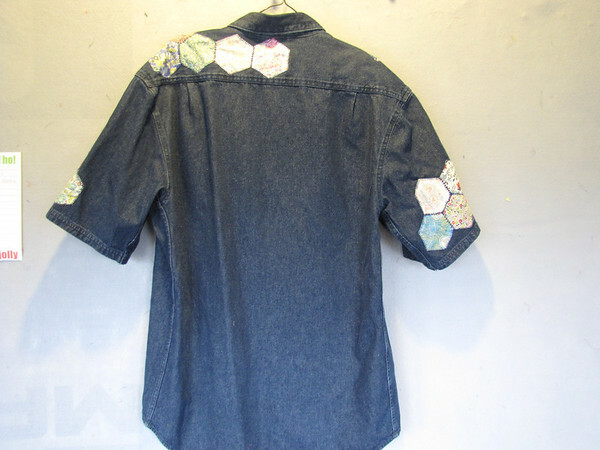 The hardest part was figuring out how to place the hexagons on the pocket while still retaining the use of the pocket. I’m not sure why that was important as I rarely use this type of shirt pocket for anything. 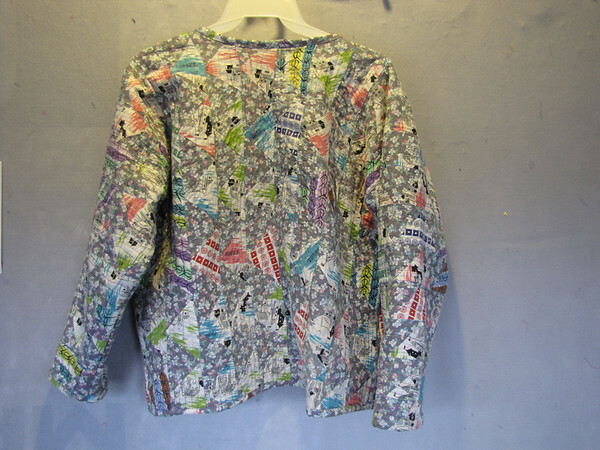 I wear this as a short sleeved jacket over a long sleeved turtleneck or T-shirt. 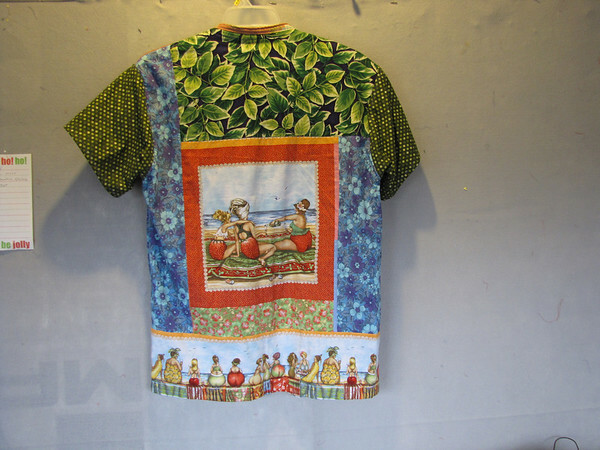 the pieces are appliqued in place with a heavy black thread and I did not take the shirt apart–making for somewhat challenging sewing. My normal attire is blue jeans or cargo pants with a long or short sleeved Tshirt depending upon the season. Occasionally, though, I do need to wear something a bit more spiffy. Over the next few days, I’ll be showing some of my creations. 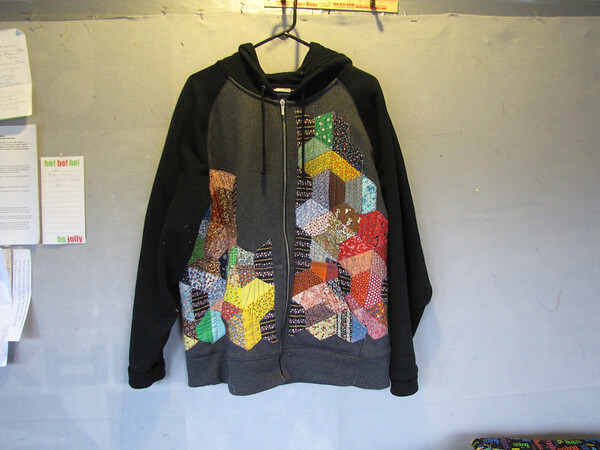 The first is a jacket made from an exquisitely pieced gray and pink triangle quilt I bought for $5. Unfortunately those precise seams were exactly 1/8 inch, too small for me to think they would last long in a quilt. 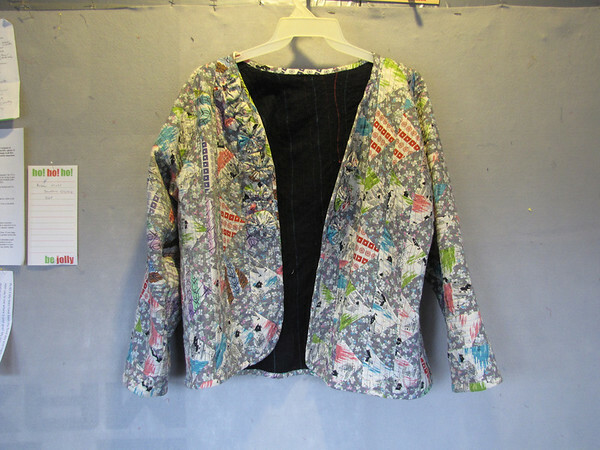 And so I turned it into this jacket with matching purse. 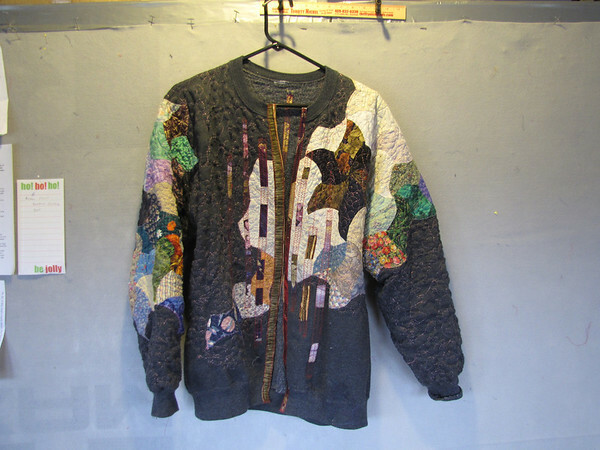 The base of the jacket is a sweatshirt I cut apart and then resewed the seams;bound the neck and added some yo-yos for detail down the front. 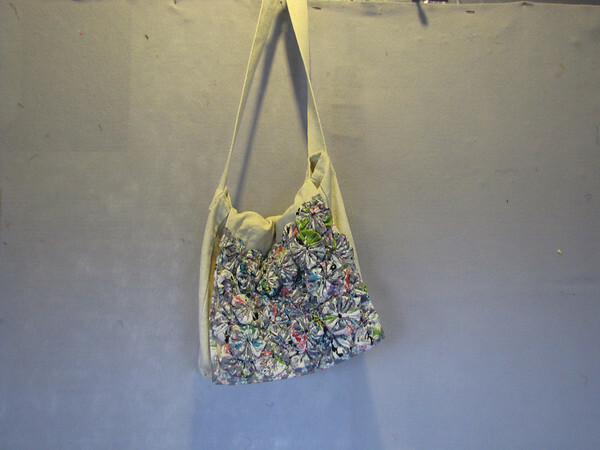 The purse is a recycled bag that was a misprint for the Denver SAQA convention. 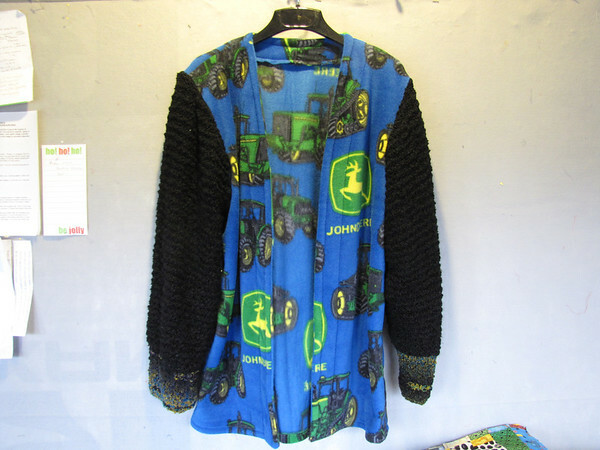 I wear this to church and other formal occasions. 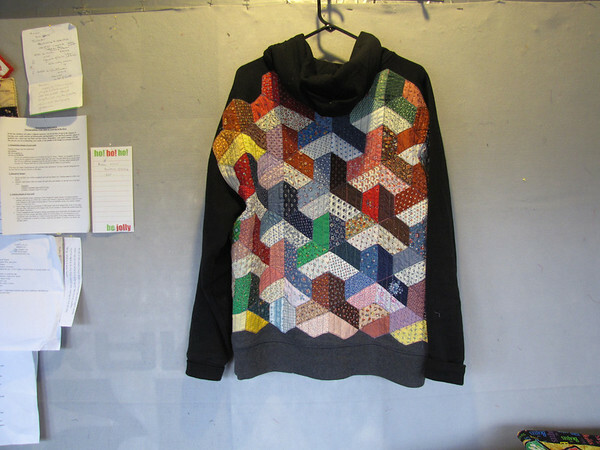 The quilting was quite simple–just follow the lines of the piecing. 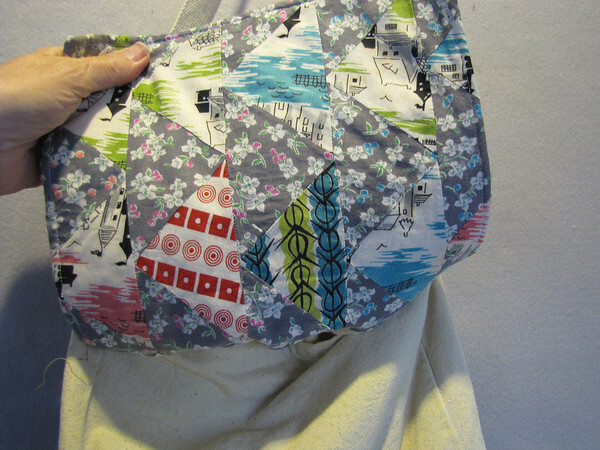 The inside of the purse flap shows the piecing. I had a few small pieces leftover for backgrounds for a small art piece that was donated to Alliance for American Quilts last year.